This past weekend, the 2013 Run Disney figure was released with mini medals available for the WDW Marathon, Half and Goofy. Now, as anticipated, Disney has announced the upcoming release of mini medals for the Disneyland Tinker Bell Half Marathon and the Walt Disney World Princess Half. The Run Disney Vinylmation figure is out now at D-Street Orlando and is due for a January 18 release at D-Street Anaheim. On that same day, should be the release of the mini medal for the Tinker Bell Half Marathon, as the race is that weekend. The mini medal for the WDW Princess Half Marathon looks to be set for a February 22 release according to the Disney Events page (the race does run that same weekend). 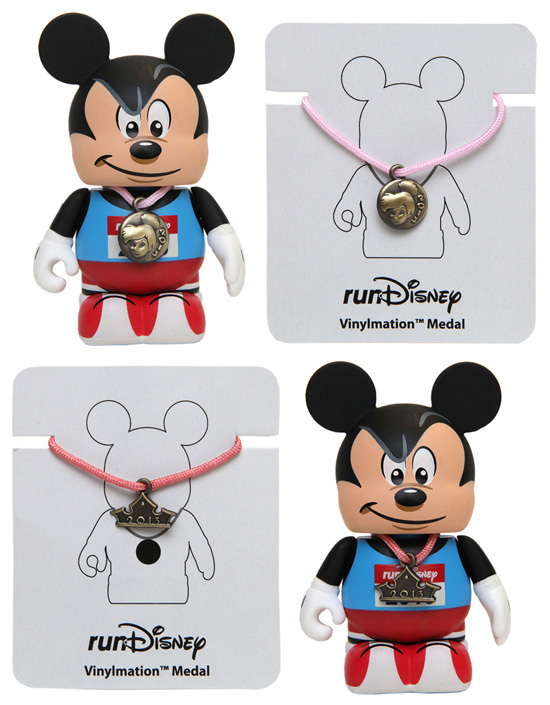 The mini medals for the three WDW Marathon Weekend races are currently available at the Clubhouse Store at ESPN Wide World of Sports and D-Street Orlando. I picked up the Run Disney figure along with the WDW Marathon Medal. Take a look at the two pictures below. You can see on the bottom picture how big the string is that hangs around the Vinylmation’s neck. It is a little bit excessive and requires some creative hanging to make it look right. I didn’t like the medal hanging below the race bib, so I tucked it up a little. If you let it hang all the way, it goes down to the shoes. Best option in my opinion is to position the medal on front where you like it, and then snap the head down onto the string. You leave a ton of excess in the back, but you can not see it when viewed head on. 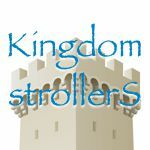 Buy the way, congrats to all the DV readers and listeners who participated in the WDW Marathon weekend. I’m starting to think the “Mask” series might be an accessory line just like these medals. Oh! That sounds like it would be interesting. How would you like to see that utilized if true? The card that comes with the medal has instructions on the back that tells you how to put the medal on the vinyl so it sits properly. Thank you for the comment. Yes, I was aware that I had to pop off the head. (I’m not sure the string would fit around the head otherwise) What I meant by my comment was you need to hold the string close to the neck and squish the head down over the string. If you don’t do that, the medal hangs too low. Its a personal preference where you would like the medal to hang, and that is easy enough to figure out even though the direction do not state that. Congrats, Nick! Did Maria Clapsis write in your finish time on your Vinylmation? I thought that was an awesome idea! I wish they just would have made the string on the mini medal shorter since you have to pop the head off to get it on anyway. Well, actually I was able to slip mine over Mickey’s head but it won’t stay in place that way.